Genesee Valley Lawn & Landscape, LLC. Located on Route. 36 in the Town of York, Hamlet of Wadsworth. 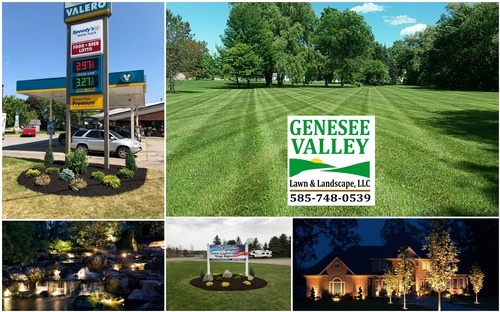 Genesee Valley Lawn & Landscape, LLC. is a lawn & landscape maintenance company, that also provides landscape design and snow removal. We provide quality, detail-oriented services to our residential & commercial customers. Your satisfaction is our guarantee. Calling all Commercial Clients, Maintenance & Property Managers! We are a full service landscape maintenance company that services the following commercial properties: - Hospitals, Nursing Homes, Doctors Offices - College Campuses, Townships - Hotels, Restaurants, Small Businesses, Office Complexes - HOAÃ?Â¢? ?s, Student Rentals, Apartment Buildings - Industrial Properties, Factories, and Large Commercial Properties We offer budget friendly, no surprises pricing with a second to none dependable quality service!